This is the second in a weekly series of posts called How to Cook Something, where I make one recipe each week from my favorite cookbook, Mark Bittman's How to Cook Everything. You can learn about the impetus for this series here. 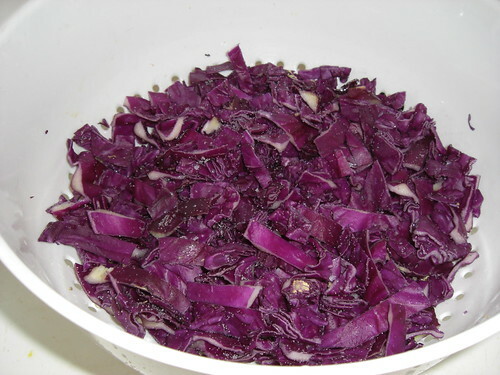 I've been intrigued by the idea of pickling things for a while now (I have grand plans to pickle the cukes I grow this summer), but hadn't tried it until a few days ago when I made Bittman's Quick Pickled Cabbage. I decided on this recipe because I had a head of purple cabbage from our CSA, and also I was curious whether this pickling method would work. I would say it tasted more like a cabbage salad than anything pickled, but I'm no expert. I'm guessing it's the "quick" part of the recipe that is to blame for that. I had hoped it would be a bit more sauerkraut-y, but apparently making sauerkraut is a pretty high maintenance ordeal. It was a refreshing summery side dish, and the caraway seeds were an interesting addition, not something I'd usually cook with. Next time I would decrease the amount of onion and caraway seeds and increase the cucumber. Or maybe I'd just pickle some cucumbers! These changes are reflected below. We ate the salad with these amazing turkey burgers, which incidentally were even better the next day as leftovers. 2. 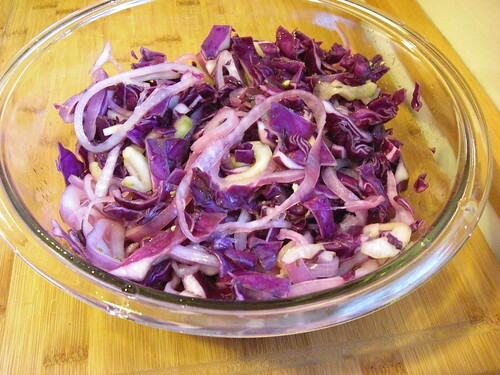 Peel and slice the red onion, separate it into rings and toss with the cabbage. Peel the cucumbers if necessary and cut in half lengthwise. If there are a lot of seeds, scoop them out with a spoon. 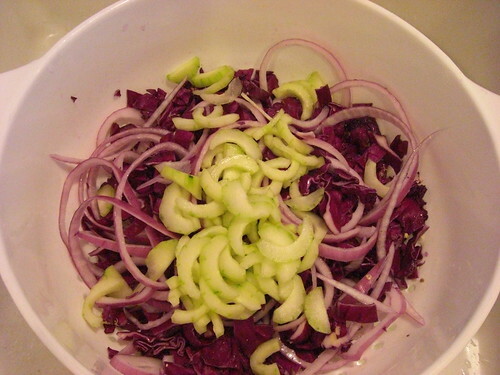 Slice the cucumbers thinly and mix the slices with the cabbage and onion. 3. 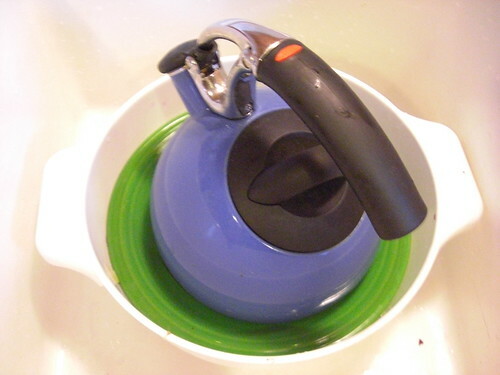 Lay a plate over the vegetable mixture while it is still in the colander, and weight the plate with whatever is handy: a few cans, your teakettle filled with water, or a brick, for example. Let rest for about 30 minutes; 1 hour is fine. 4. Rinse the mixture, dress with caraway seeds and vinegar, and serve. This will keep refrigerated quite nicely for a day or 2. Sauerkraut is not hard, it just takes time to ferment. If you haven't made it yet I highly suggest it. You'll never settle for canned stuff again!